Awards are offered for completion, Top Ten, Reserve Champion and Champion in both the Arabian and Half-Arabian Divisions. AHDRA's forty-year-old traveling trophy – the Harry McGlothlen Trophy – will be given to the first purebred Arabian gelding across the line in the 100 Mile Event. Team awards are planned. All rides are recognized as AHA local rides (exception Novice CTRs) and are sanctioned by Upper Midwest Endurance and Competitive Rides Association (UMECRA). Arabian Breeders Sweepstakes nominated horses will earn points in all eligible rides. Rules for competing and qualifying may be found at www.ArabianHorses.org, under Competitions → National Events → Distance Nationals. More information about the ride venue, location, and schedules will be available on AHA's web site, on AHDRA's website, and on AHDRA's group Facebook page. The Jim Edgar Panther Creek (JEPC) Park offers riders varied terrain, having hills and flat ground. There is occasional gravel, so shoes are recommended, though not required. The facilities offer 51 electric campsites, 38 of which may be reserved. Overflow camping in a primitive setting is also available. Showers and toilets are on-grounds. Cabins are available for non-campers. Reservations may be made in advance by going to www.ReserveAmerica.com. SLADE, Ky. – The Sheltowee Trace National Recreational Trail – the longest trail in Kentucky – is appropriately named in honor of Daniel Boone, the pioneer who hiked through Kentucky in the 1700s on hunting trips. Sheltowee, or Big Turtle, was the name given to Boone by the Shawnees who captured him. This is why signs along the Sheltowee are blazed with the popular turtle logo. Beginning in Tennessee at Pickett State Park, the trail stretches north from the Big South Fork National Recreation Area up through the Daniel Boone National Forest to just beyond Morehead, Ky. Some 269 miles of the trace’s 282 miles are found in Kentucky. The Sheltowee Trace is often described as the backbone to the Daniel Boone National Forest. The forest is broken into four ranger districts: Cumberland, London, Redbird and Stearns. The Sheltowee Trace travels through all but the Redbird district. Many hike the Sheltowee in sections, and a few brave adventurers tackle the entire trace at once. This trail is very popular as a training location for longer hikes such as the Appalachian Trail, the North Country Trail, the Continental Divide Trail or the Pacific Crest Trail. Each of these trails is more than 2,000 miles in length, and the Sheltowee Trace gives hikers an idea of an extended hiking experience without ever being too far removed from developed areas. One truly exclusive attraction along the Sheltowee Trace is the Red River Gorge National Geological Area. This area is home to some of the most unique geological formations anywhere in the country. Due to the numerous cliff faces and rock outcroppings, the Red River Gorge has become a world-renowned climbing destination. There are several outfitters in the area that serve rock climbers, as well as places where people can climb on their own. Natural Bridge State Resort Park, with a lodge, cottages, campground and restaurant, serves as an excellent rest stop in the gorge. Along with hiking, there are sections of the Sheltowee that are open to other users. Mountain bikers and equestrians have access to certain sections, as well as numerous spurs and adjacent trails. There are four campgrounds that cater to horseback riders. White Sulphur is located in the Cumberland Ranger District, Little Lick in the London Ranger District and Barren Fork and Bell Farm campgrounds are in the Stearns Ranger District. ATV users will also enjoy a designated ATV/OHV campground at White Sulphur in the Cumberland Ranger District. The entire Redbird Ranger District’s trail system is also designed for use by ATV riders. There are several popular mountain bike trails surrounding Cave Run Lake, just outside of Morehead. The most popular single track for mountain biking on the Trace is from KY Hwy. 80 south to Laurel Lake and back. There are several places to access the Sheltowee Trace, and many of these locations are working on enhancing their trailheads and services offered to trail users. Some of the communities the trace goes near include Morehead, McKee, Slade, Livingston, and Stearns. Several towns throughout the national forest have begun to work towards becoming a certified Kentucky Trail Town through the Kentucky Office of Adventure Tourism. A Trail Town certification will signal to visitors that these locations have the needed services and accommodations one may need while enjoying the Sheltowee Trace or any of the other recreational activities in the forest. “These Trail Towns should greatly enhance what is an already memorable trail experience on the Sheltowee Trace,” said Elaine Wilson, director of the Office of Adventure Tourism. There are plenty of things to see and experience along the Sheltowee Trace, and the Sheltowee Trace Association works hard to keep the trail in the best possible condition. The Sheltowee Trace Association hosts a website and helps organize trail work days and group hikes. To learn more about all it does, visit www.sheltoweetrace.org. For questions about the Daniel Boone National Forest and any of the recreational opportunities it offers, visit the website at www.fs.usda.gov/dbnf. To find information about all of the outdoor opportunities and locations, as well as a calendar of events happening all across Kentucky, visit the Office of Adventure Tourism’s website at www.getoutky.com. Don’t forget to “like” us on Facebook, www.facebook.com/KYOutdoorAdventure, and follow us on Twitter at www.twitter.com/kyadventures! The Pacific South region's Laurie Birch and her mare Scudd Run have won the 2012 National AERC Mileage championship, covering 2540 miles this season. Carla Richardson and SS Kharady Khid +/ from the Mountain region, last year's National Mileage Champions, were second with 2135 miles. Scudd Run's lifetime mileage stands at over 5400 miles, and SS Kharady Khid +/ is over 8800 miles. Mountain region's Bev Gray's gelding Jolly Sickle won the National Best Condition award. He had 11 BC's over the season. The National LD Mileage Championship went to Gayle Pena and GP Bold FX from the Pacific South region, with 550 miles. Alex Church and his pony Desert Sun Enchantress from the Northwest region won the Junior division with 450 miles. His sister Abrie Church and Moonlight Sarahnade were third. Three Juniors are tied for the Junior National 100-Mile award, with 200 miles: Bryna Stevenson from the Northeast, Brooke Koehn from the Midwest, and Dillon Thomas from the West. Ann Kratochvil's GF Brazil's Envy from the West region won the War Mare Award, the mare/rider team with the most points during the season. Laurie Birch and Scudd Run were second. Ann also won the Bill Stuckey award, honoring the rider 65 years of age or older who completed the greatest number of miles in the season. Cheri Briscoe's MMF Thunders Echo + from the Pacific South won the Jim Jones Stallion Award, for the stallion with the most miles completed in the season. Thunder had 1405 miles. *Most year-end results are in, but here results are unofficial. The official ride results appear in the Endurance New magazine. 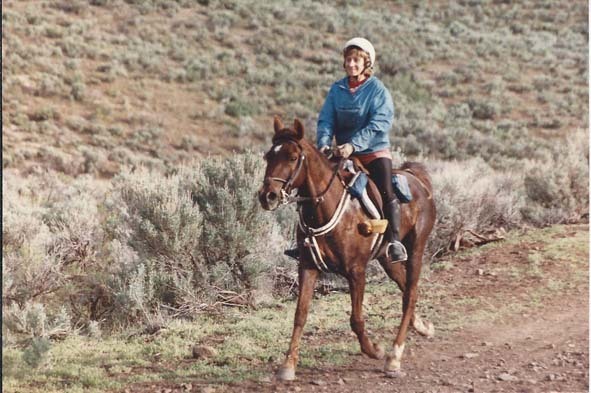 In November, Horsereporter recognized Beverly Gray’s great record on her endurance horse, JollySickle. Recently, the American Endurance Ride Conference also recognized the top performance by this duo, culminating in the 2012 AERC National Best Condition award for the gelding. When the Executive Administrator of the North American Trail Ride Conference (NATRC) sends you an email, asking about providing representatives at a ride clinic, one would be wise to agree. This is exactly what happened when the “Arizona Triple Crown” ride managers received emails from Laurie DiNatale, asking if they would please represent NATRC at a clinic on November 27, 2012, in Benson, AZ. “Where,” you may be asking yourself, “is Benson, AZ?” Benson is a small town, about 45 minutes southeast of Tucson, AZ. Despite the small-town location, there was nothing small minded about the clinic host, Heidi Vanderbilt, owner of Lucky Pup Ranch where the clinic was held. 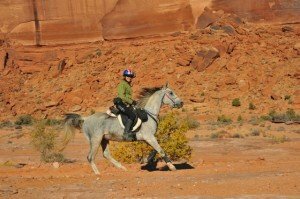 Heidi received assistance from Marilou Balloun, Southern Arizona Arabian Horse Association, and originally planned for the clinic focus to be for riders interested in learning about American Endurance Ride Conference (AERC) competition. However, Vanderbilt has hosted and participated in numerous clinics, both at her ranch and around the country, so she decided to change things up for this clinic. She invited presenters from varied backgrounds to talk about the value each person feels they have gained from competing in either or both NATRC and AERC rides. Karen Chaton's Granite Chief +/ reached 13,000 career miles after completing day 2 of the Death Valley Warmup ride in California yesterday. Karen has handled the reins in every one of 17-year-old Chief's miles over 11 seasons. Chief has only 3 pulls in 258 starts. 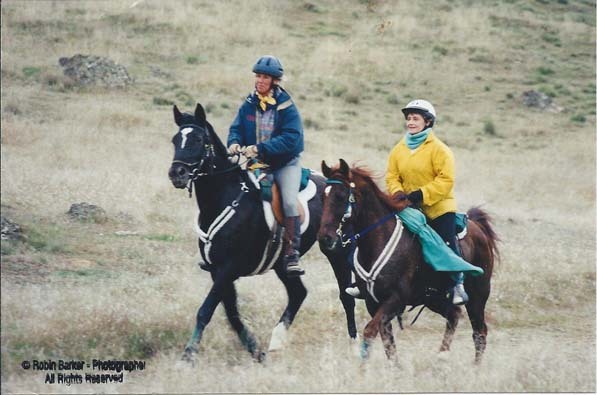 As all of Karen's endurance horses, Chief has excelled at multi-day rides, and he participated in the 2010 XP ride across the Pony Express trail from Missouri to Virginia City, Nevada. A member of the "Decade Team" (horse and rider teams that have competed together for ten ride seasons in 50 miles and up), Karen got Chief, a Classical Spanish and CMK Arabian, from his breeder for free as a 5-year-old, because the breeder wanted him to "do something." 'Do Something' he did. 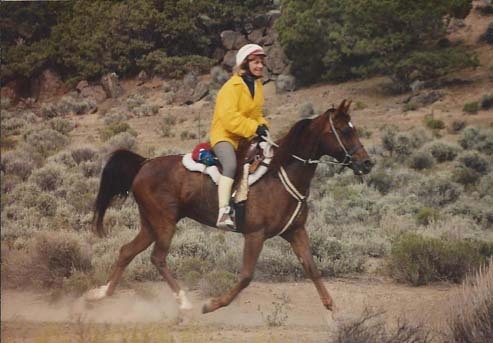 Granite Chief +/ is currently 6th on the AERC list of high mileage equines. 2013 AERC Convention: Endurance, endurance, and more endurance! The annual AERC Convention will be held in Reno, Nevada on March 8 and 9. "It's a fabulous 2 days of endurance, endurance and more endurance!" The lectures, seminars, dance, regional awards, national awards banquet, and trade show will take place at the Grand Sierra Resort and Casino. Speakers include Trisha Dowling, DVM, MSc, DACVIM (LAIM), DACVP; Sarah Fletcher, MD; Karen Hassan, DVM, DACVS; Jeanette Mero, DVM; Hal Schott, DVM, PhD, ACVIM; Donna Snyder-Smith; Aarene Storms; and Jeannie Waldron, DVM. Hot Topic sessions include: Liability issues at endurance rides; Dogs, guns and steel. Seminars include Hoof balance and lameness issues; Tying up; Better rider biomechanics; Lyme disease; Endurance 101; The secrets to winning Best Condition; Ethics and drugs in competition; and Equine metabolic diseases. After a few more details bounced back and forth I said I'd come have a look. The next day I was headed to LaPine to look at what was probably going to be our next winter project. at that time we often bought these horses, put a lot of riding on them and made a good horse out of them again. We resold them in the spring or summer, whenever the horse was ready. We were thankful to be able to rescue these horses from what could be a terrible fate. The hopeful seller came out and pointed me to the corral. Standing there was one shaggy, a bit thin, ewe necked and sickle hocked gelding. I scowled inwardly and pitched a little rock in his direction so he’d trot. I grinned inwardly at the result, it was actually a “wow” at a very floaty smooth efficient movement. We entered the corral as we chatted and the horse eyed us warily and took off. “Bolt.” I replied looking from the horse to him. Twenty-six years ago last month, a little red horse came into my life, and today his life ended. He took me to some incredible places I never would have gone, and he changed my life forever. 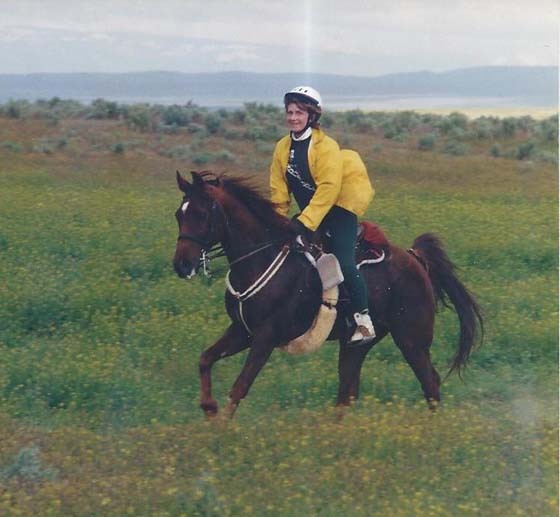 Ambers Thorn competed in endurance every year between 1987 and 2000, racking up over 7200 AERC miles. Most of his finishes were in the top 10, and he competed in 2 FEI rides and several 5-day rides. He competed in 8 western states and Canada. 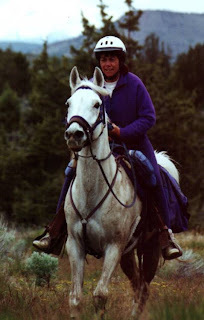 His last endurance ride was at Bandit Springs in 2000. I bought him from my friend, Andrea Day in 1986. I first learned about him from a notice inside the door of an outhouse at a ride in Vale, Oregon. He was a bargain at $200. Thorn was a tough and determined competitor throughout his career. He taught me alot of things, and he taught me more about equine veterinary medicine than I ever wanted to know. He survived a torn check ligament, 2 annular ligament surgeries, a severe case of anterior enteritis, and a life-threatening nephrosplenic entrapment, among other things. Like a cat, Thorn seemed to have 9 lives and he recovered from most of his brushes with death, stronger than ever. Thorn enjoyed his retirement in Owyhee County, spending most of the time with his old buddy, Simon. The last 6 weeks or so were rough on us. About every week or so, he fell, and it was increasingly difficult for him to get up. Until today, he was fine after he got up. Today, once up, he tottered over and fell again. I had known he might not make it through the winter and almost put him down before I left on a 10-day trip last month. I asked him to give me a sign, and he trotted in for breakfast and galloped in for dinner, so I decided it wasn’t time. But I had my neighbor dig a grave for him anyway. Fortunately, Thorn waited for me and had no problems in the 10 days while Skyla Stewart was house-sitting for me. I got home Wednesday and was able to enjoy his company for a few more days. This morning, when she heard about Thorn being down, Kris Troxel came to my place just before Idaho Equine veterinarian Pete Knox arrived.. It was great that Kris and Pete were the ones here. Thorn managed to muster the energy to get up one last time and allowed us to lead/push him to within a few feet of his grave. Once Thorn was gone, Pete used my tractor to take Thorn the rest of the way, and Kris and Pete lowered him into the grave. I am so grateful for their help. I will miss him more than anyone can imagine.